Schiller station was built as part of the original main line of the Northwestern Elevated in 1900. 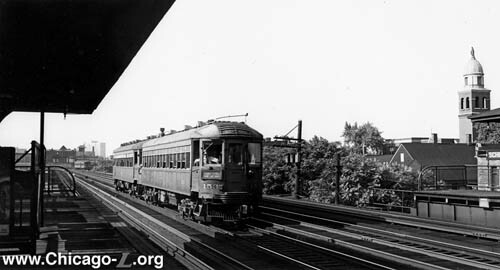 The only line in Chicago to do so, the Northwestern "L" built four tracks north of Chicago Avenue to allow for both local and express service. Some stations, like Schiller, were built with platforms on the outside tracks (for locals only), but some had two island platforms to facilitate both express and local trains. The headhouse was one of several stations built from a design by William Gibb on what is now the Brown Line. Constructed entirely of brick with terra-cotta trim, the Classical Revival design was inspired by the work of the great 16th century Italian Renaissance architect Andrea Palladio. The bold modeling of the details, especially the columns and segmented arched windows, is characteristic of Italianate work of the late 19th century. The interior featured plaster walls with extensive wood detailing in the door and window frames, ceiling moldings, and tongue-in groove chair rail paneling. The brick station house was similar to those still at Chicago, Sedgwick, Armitage and Diversey. The dual side platforms at Schiller were covered in the center by two peaked-roof canopies of steel supports with gently-curved brackets and intricate latticework, covered by a corrugated metal roofing. As built, these covered about half the platform length. The railings consisted of tubular frames and posts with panels of decorative, ogee patterned metalwork inside. The station had an unremarkable history for the next several decades, serving mostly local walk-in traffic from the surrounding apartment houses. Schiller briefly survived the CTA's 1947 takeover, but was one of 23 stations closed in their North-South Route service revision August 1, 1949, which included the closing of several other stops on this line including Division, Oak, Larrabee, Halsted, Webster, Wrightwood and more. The concept of "local" stations, of which Schiller's low usage was only suited, was not a part of the A/B skip stop concept and the station was closed. Today, the entire station is gone and nothing of it remains.